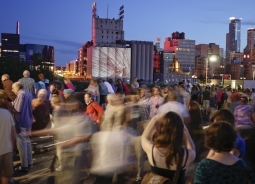 Had the occasion to look at documentation of Battle of Everyouth from Northern Spark last year. Really great. Jenny Schmid, one of the co-creators with Ali Momeni, is doing a new piece this year, nightdemons at the Weisman Art Museum with Drew Anderson, who had an amazing piece, Near the Ghosts of Sugarloaf, at the AOV3 exhibition at The Soap Factory a couple of months ago. Can’t wait to see their newest work with MAW.